The laminate dynamic simulation random event reads the results from an NX Nastran SOL 103 real eigenvalues solution and uses an efficient modal approach and advanced integration algorithms to efficiently produce accurate peak responses that correspond to the specified confidence level. This tips and tricks shows how to use Simcenter Laminate Dynamics to quickly evaluate the behavior of a satellite antenna assembly subjected to the base-driven random excitation function shown in Figure 1. The input power spectral density has an irregular shape because it has been notched using a force-limited vibration approach, in order to avoid overtesting at the fundamental X-axis mode of the antenna. Figure 1: Excitation PSD curve. failure of the composite plies will be established using the classical Tsai-Wu failure criterion. Then, create a Nastran SOL 103 Real Eigenvalues solution. 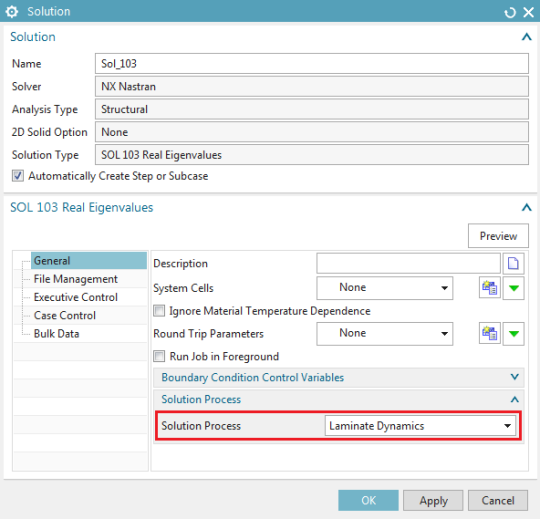 You must set Solution Process to Laminate Dynamics on the General tab in the Solution dialog. Set the Solution Process to Laminate Dynamics. The laminate dynamics solution process simulates a base excitation; therefore, there should be a single excitation point in the model. In a case where there are multiple constraints in a model, you can connect all of those interface degrees of freedom to a single node using a rigid element and then fix the single node. 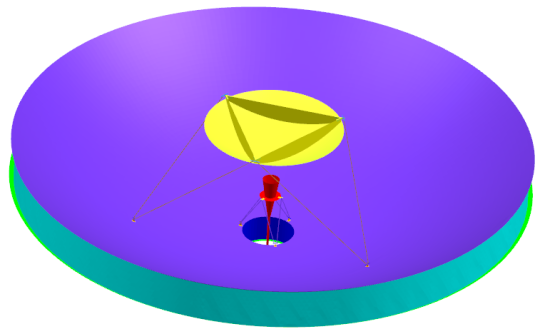 In the satellite antenna example, Figure 4 shows that the three inner intercostal supports are all connected to a single, constrained node using an RBE2 element. 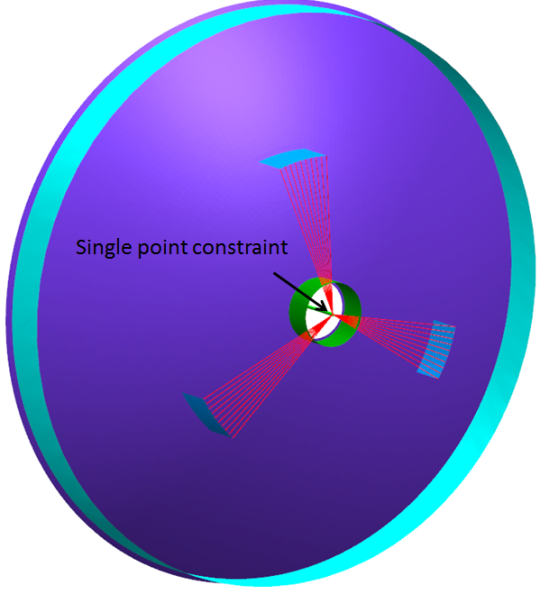 Figure 4: Create a single excitation point. 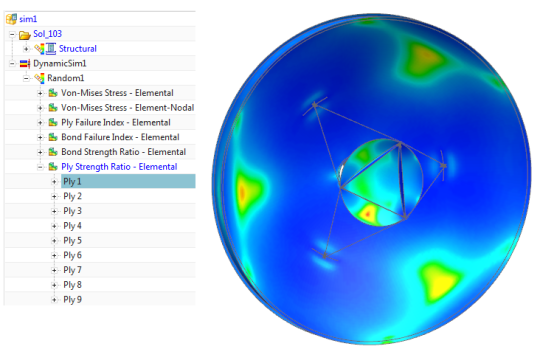 Laminate Dynamics Simulation computes results starting from those Nastran results that are stored in the parent OP2 file. 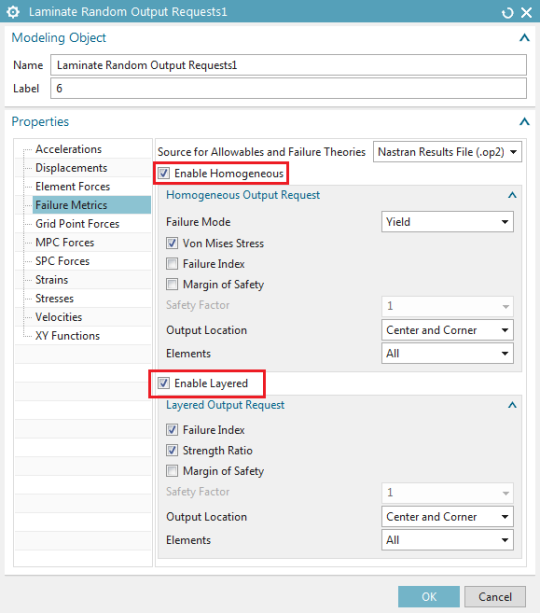 To request results output in the OP2 file when you solve the Nastran solution, you need to create a Structural Output Request modeling object. All ply and interlaminar failure theories require the stress output request except the maximum strain ply failure theory, which requires the strain output request. In order to process displacements, accelerations, and velocities only the displacement request is required. 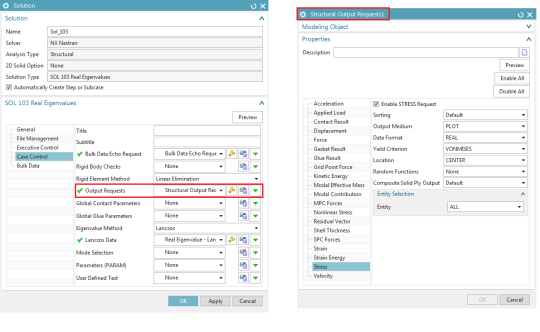 To create/modify a Structural Output Request, in the Solution dialog select Case Control and then select Structural Output Request. As a general rule you should retain, at a minimum, all the modes with resonant frequencies that lie within your random input lower and upper frequency bounds. For better accuracy, you should retain all modes up to a frequency that is at least twice your upper bound. 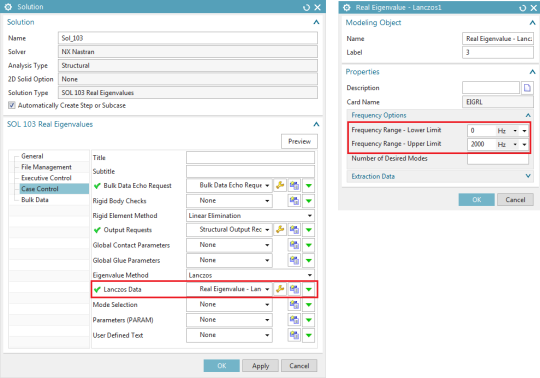 Control and then select Lanczos Data. In the Real Eigenvalue dialog enter the required frequency range. Define the frequency range for SOL103 eigenvalue solution. 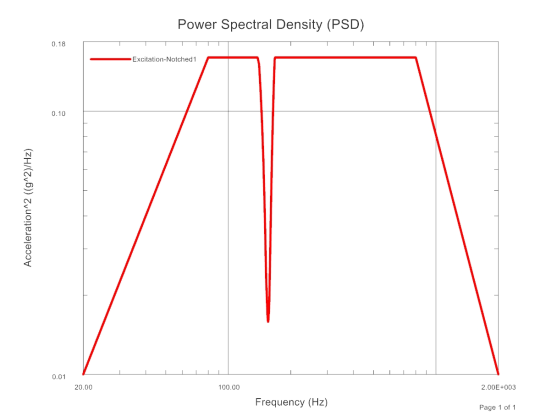 In this example, the PSD excitation in Figure 1 is between 20 Hz and 2000 Hz, so as a minimum all the modes with frequencies in this range should be retained. We run the solution between 0 and 2000 Hz. 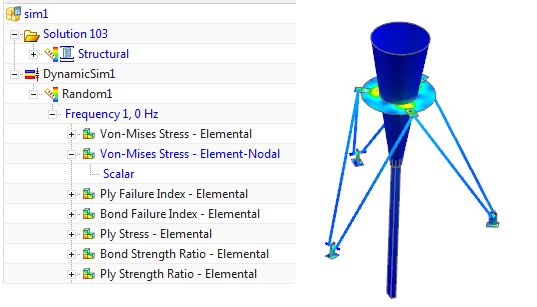 We then perform a quick modal summary analysis using Structural Analysis Toolkit for Nastran (SATK) to evaluate the modes’ effective mass, an indication of the amount of mass that coherently participates in each mode that also is a conservative criterion to define the cut-off frequency. The modal summary result, Figure 7, shows that the cumulative effective mass in each axis is above 98% of the antenna’s rigid body mass: It is therefore not necessary , to calculate modes up to 4000 Hz (twice of the upper limit of the PSD excitation frequency), saving time and resource in the running Nastran Solution 103. Figure 7: Modal summary analysis by SATK. It is worth mentioning that if you do not retain enough computed modes for your frequency response range, you can account for modal truncation effects by invoking either a residual vector or a residual flexibility approach. 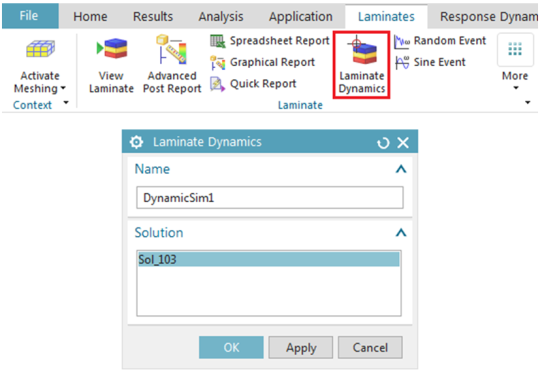 When the Nastran Solution 103 is completed, in the Laminates tab click on Laminate Dynamics. In the Laminate Dynamics dialog, define a name for the solution, select the parent structural solution from the list, and click OK. Create a Laminate dynamic solution. 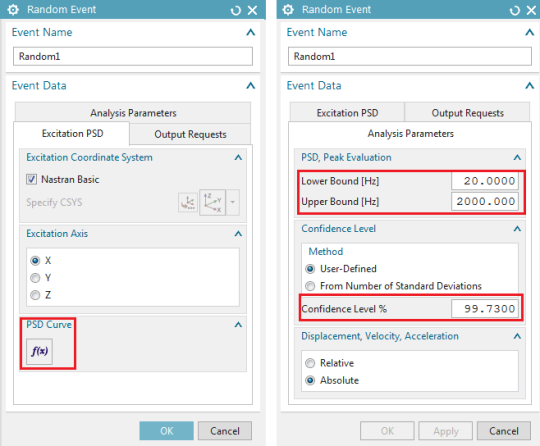 In the Simulation Navigator, expand the Dynamic simulation node and click on the Normal Modes node, which shows the number of modes used in the dynamic solution. Expand the Laminate Dynamics Detail View, you can optionally select a subset of the modes that Nastran computed. 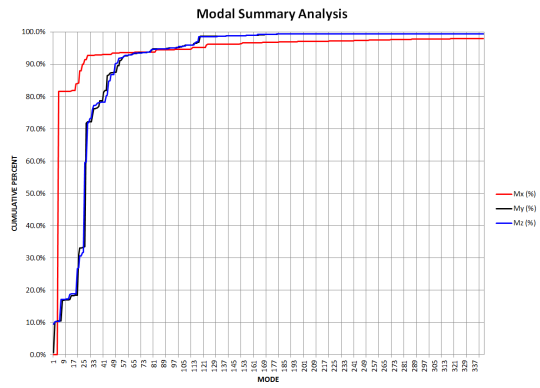 Modes used in dynamic simulation and their assigned damping value. Damping Factor dialog enter the viscous damping value. Event dialog, under the Excitation PSD tab, click on the use a function icon, where you can browse for the already defined function. Parameter tab, set the lower and upper bound of the frequency solution, which can be a subset of the frequency range of the input function. You also need to define the desired confidence level. We used 99.73% confidence, which corresponds to the 3 times the standard deviation which is an industry default. From the Random Event dialog, you also define the Laminate Random Output Requests modeling object in which you specify the desired output requests. A wide range of outputs can be simultaneously requested. In this case, we request failure metrics only. Enable Homogenous will compute failure metrics for elements that reference homogeneous materials. The Laminate Dynamics solution uses the peak Von Mises stress to compute the failure index and the margin of safety. The peak Von Mises stress correctly accounts for the phases of the constituent stress tensor components, and corresponds to the confidence level specified previously: there is no need to manually multiply by the number of standard deviations. Enable Layered computes failure metric results for elements that reference a laminate physical property or a solid laminate physical property. The equations for failure index, strength ratio, and margin of safety depend on the failure theory that you selected in the Laminate Modeler when you defined the layup in the FEM. In this case we have specified the Tsai-Wu failure criterion, which uses a second order equation composed of the stress tensor components. Simcenter Laminates accounts for the phases between the components when accurately computing failure indices, strength ratios as well as margins of safety on a ply-by-ply basis. The failure metrics also correspond to the desired confidence level. Output request for random dynamic analysis. 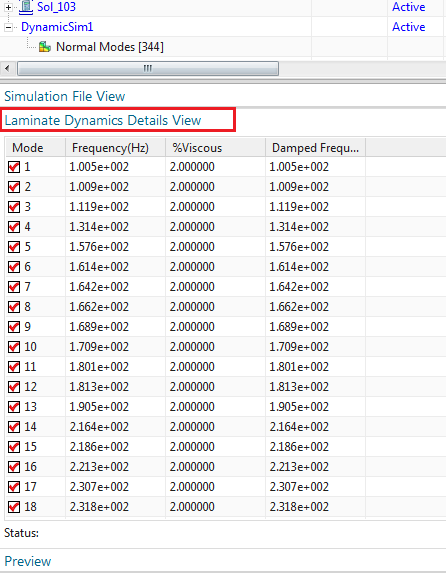 To solve the Laminate Dynamics event, in the simulation navigator, right-click on the Random event and select Solve. When the solution complete, the results can be viewed in Post Processing Navigator. Plot of Ply 1 strength ratio. Plot of Von-Mises stress in metallic parts.